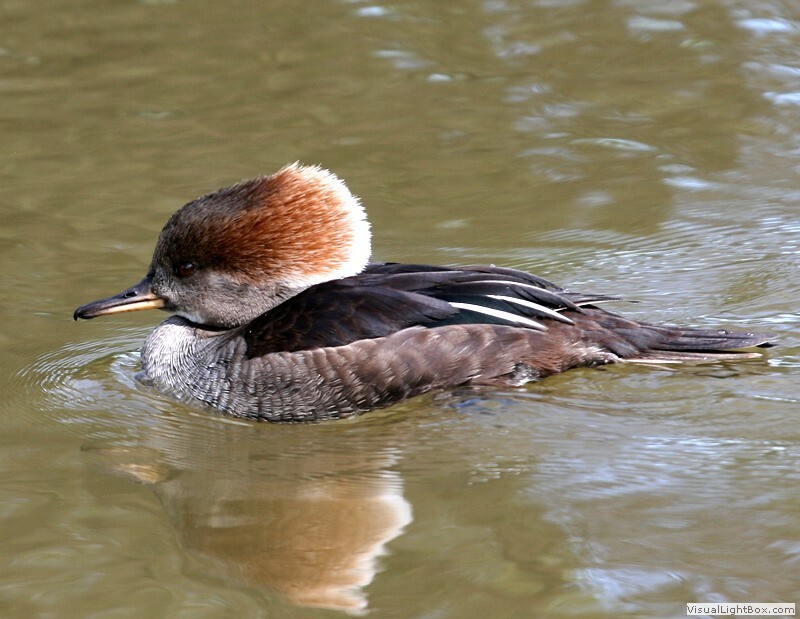 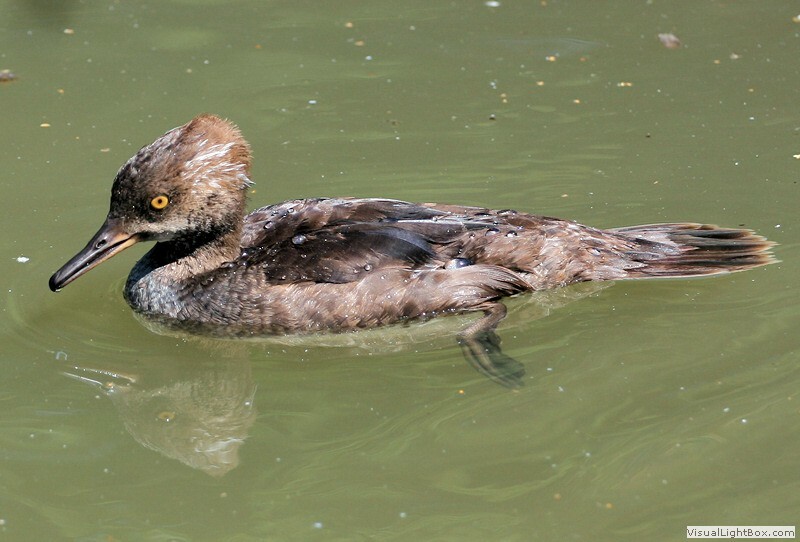 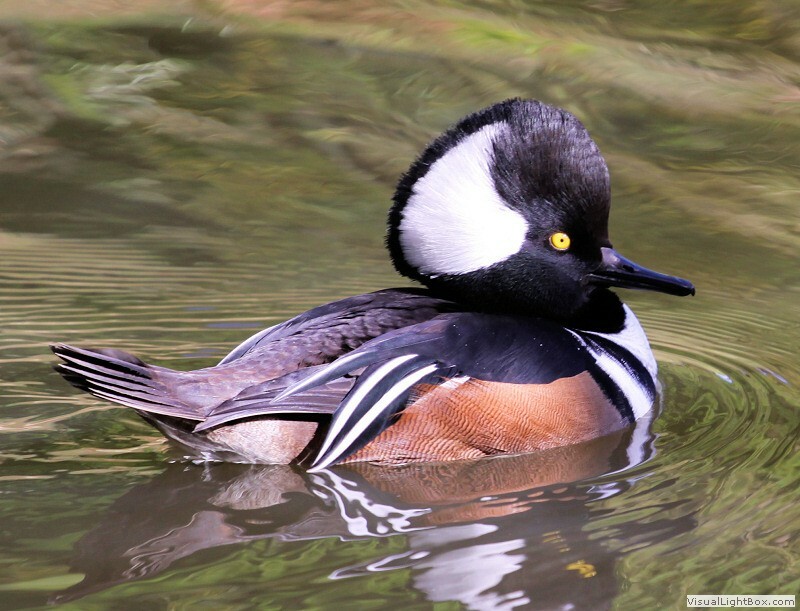 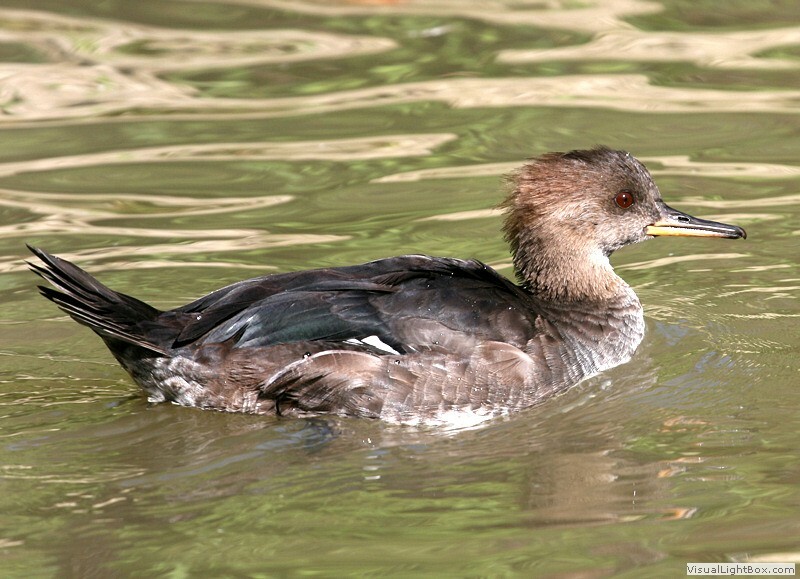 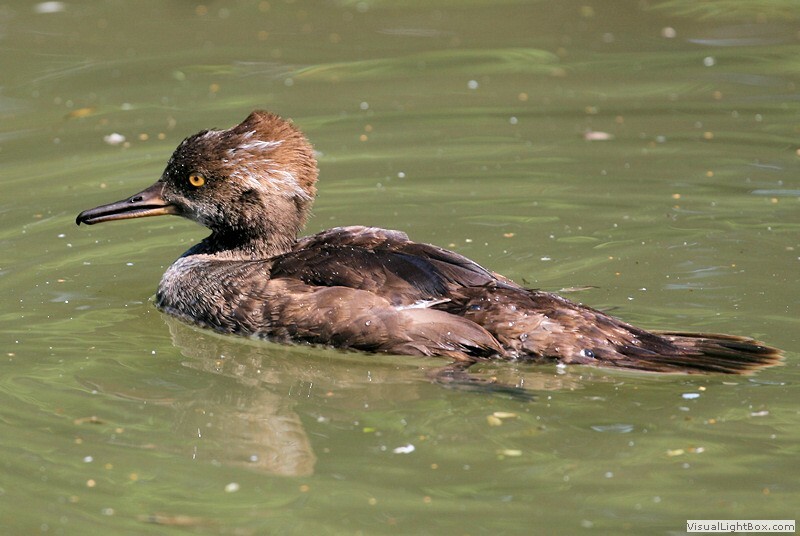 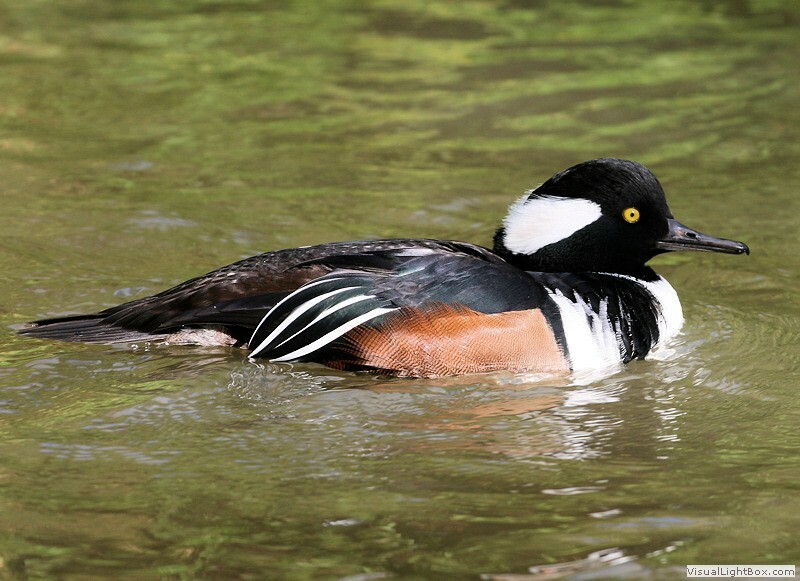 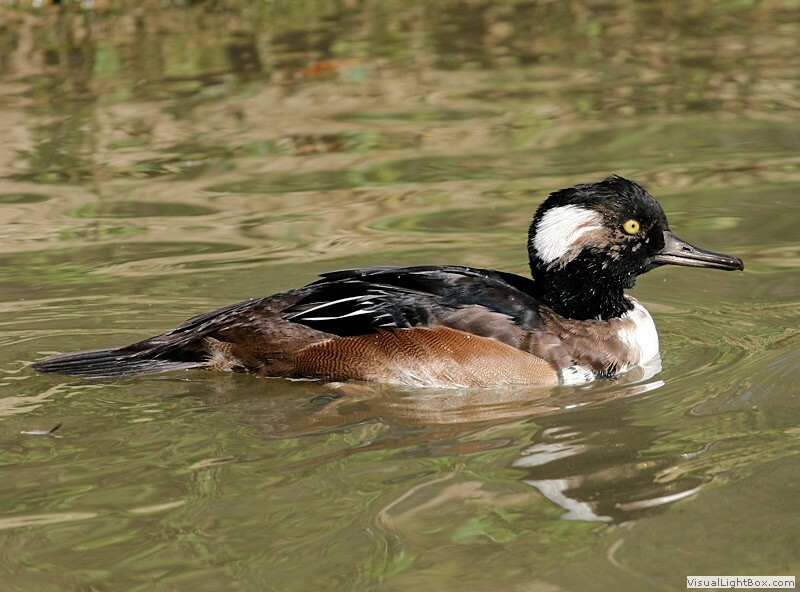 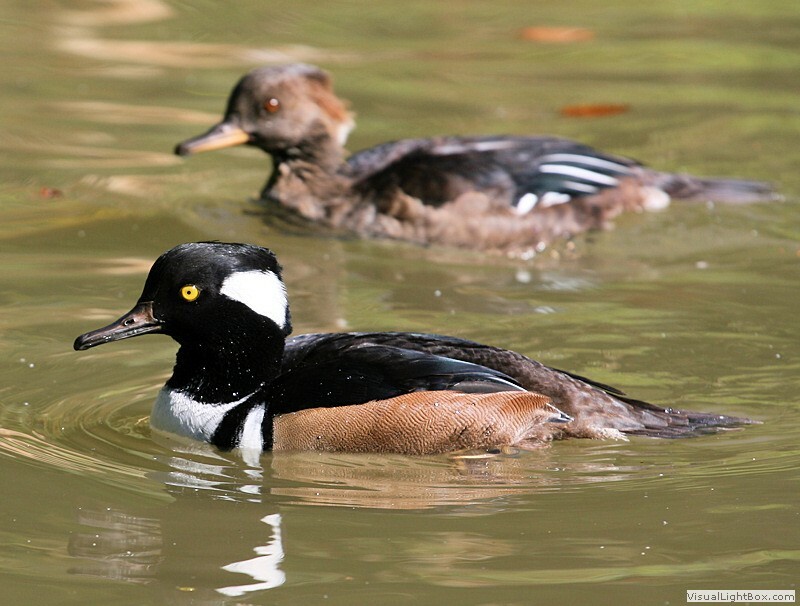 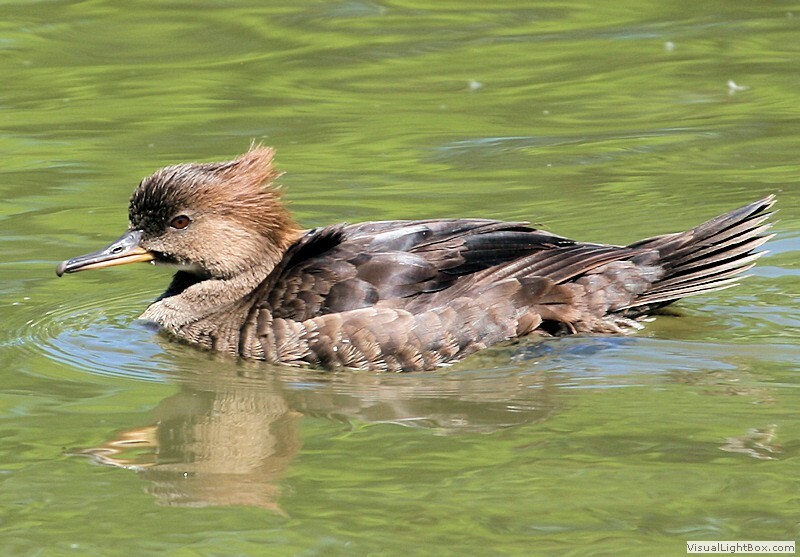 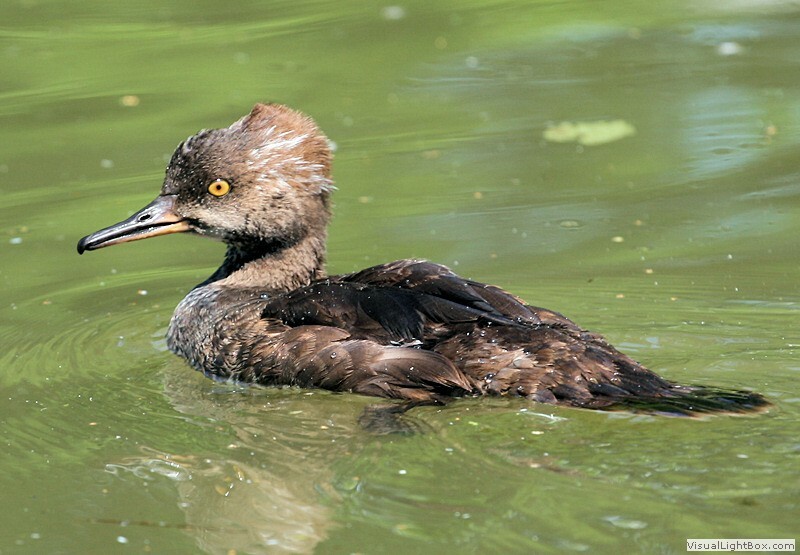 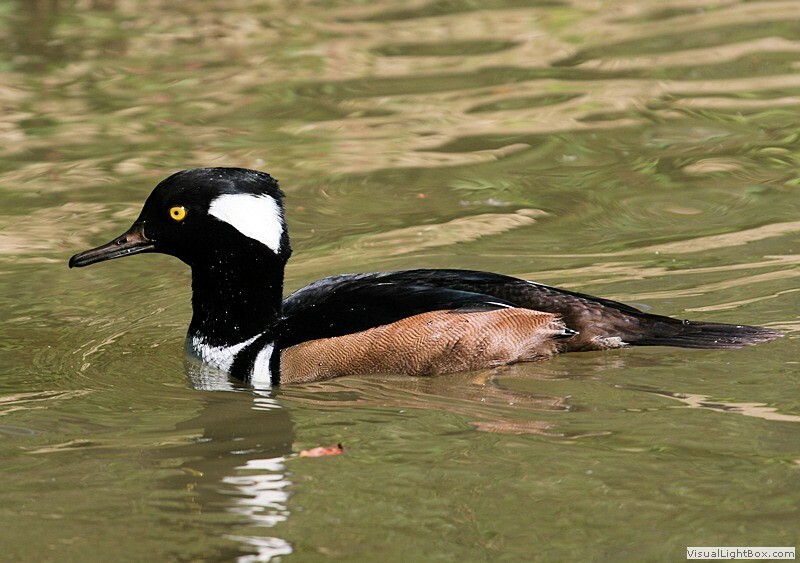 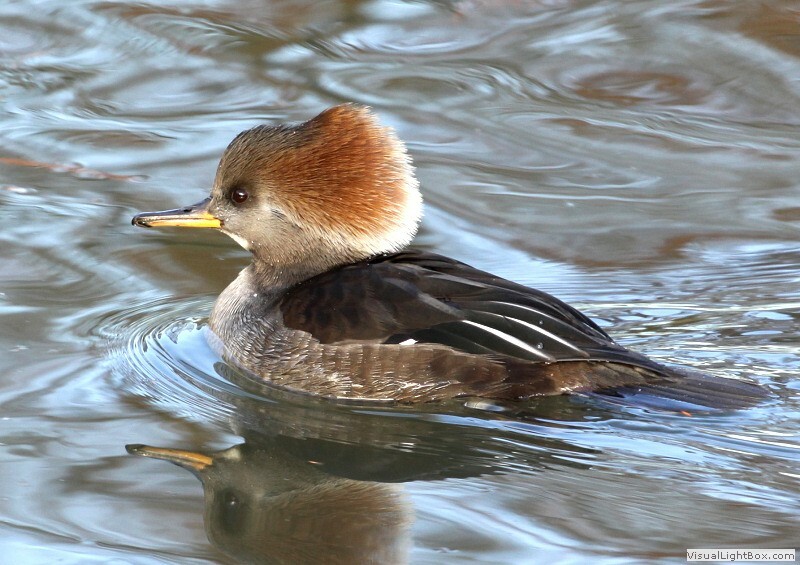 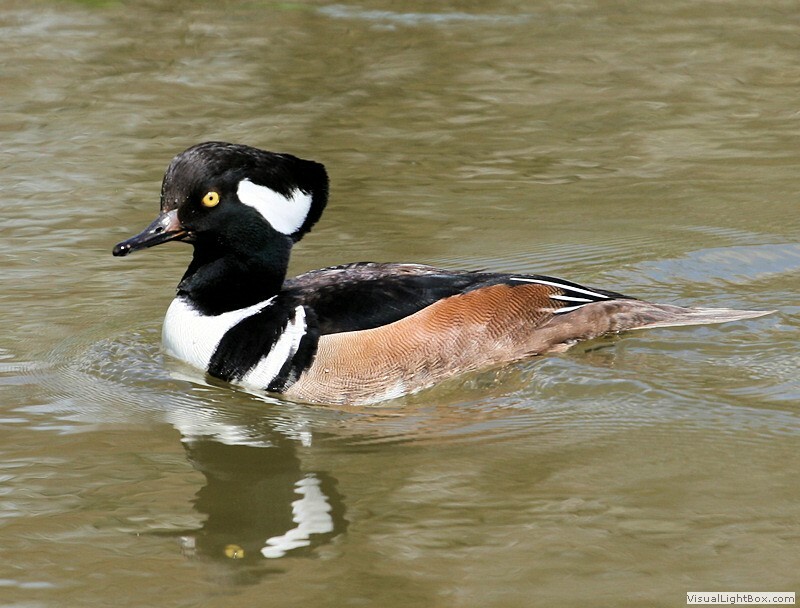 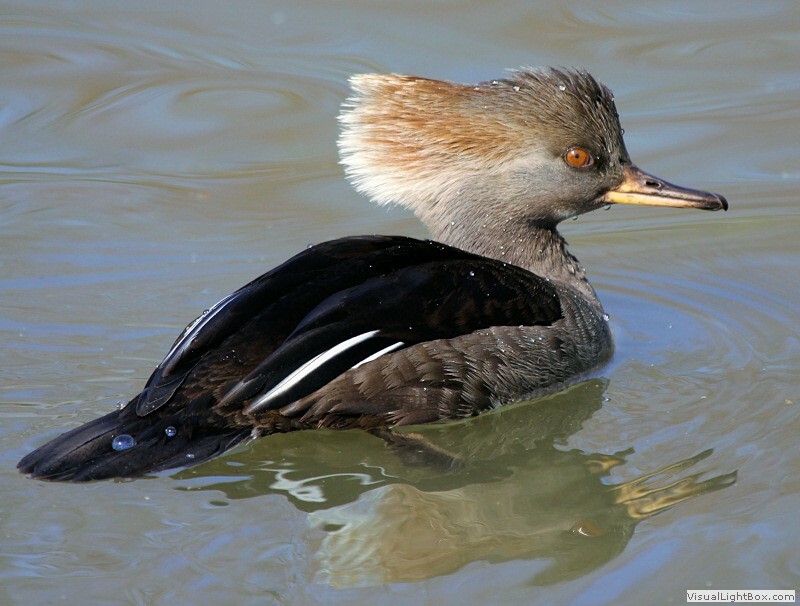 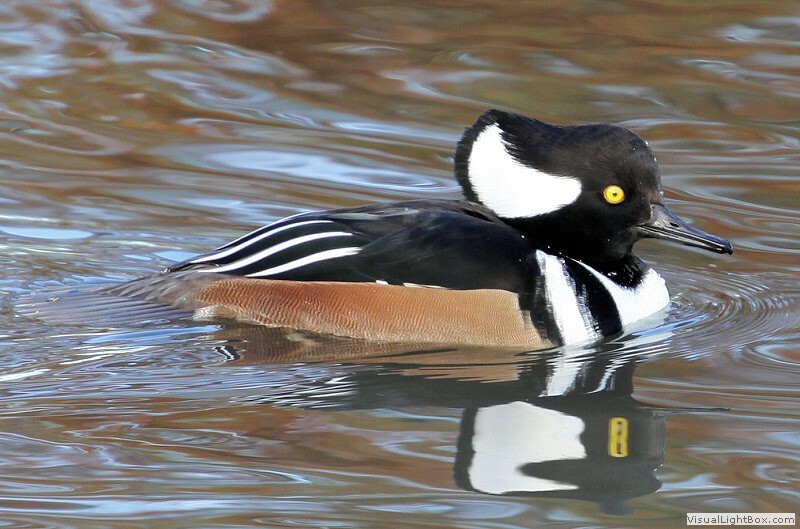 Identify Hooded Merganser - Duck - Wildfowl Photography. 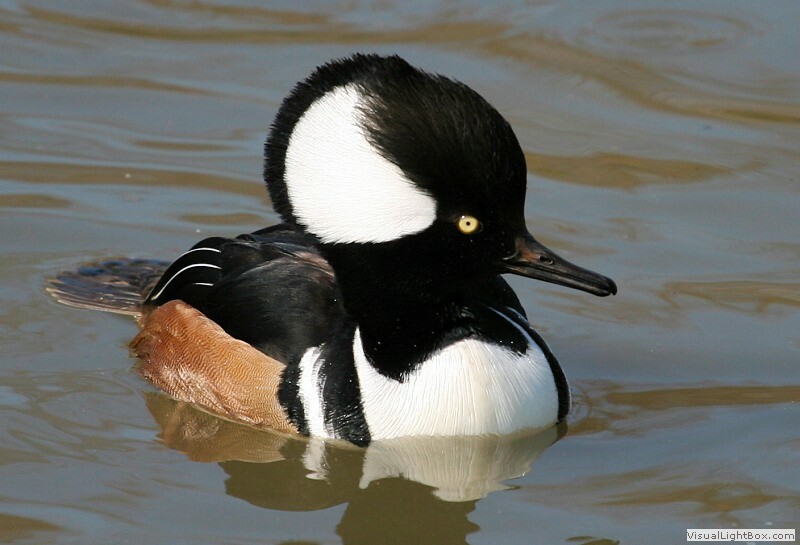 Male - The male Hooded Merganser has a black head with a large white patch from behind the yellow eye to its bushy crest which can be expanded or contracted. 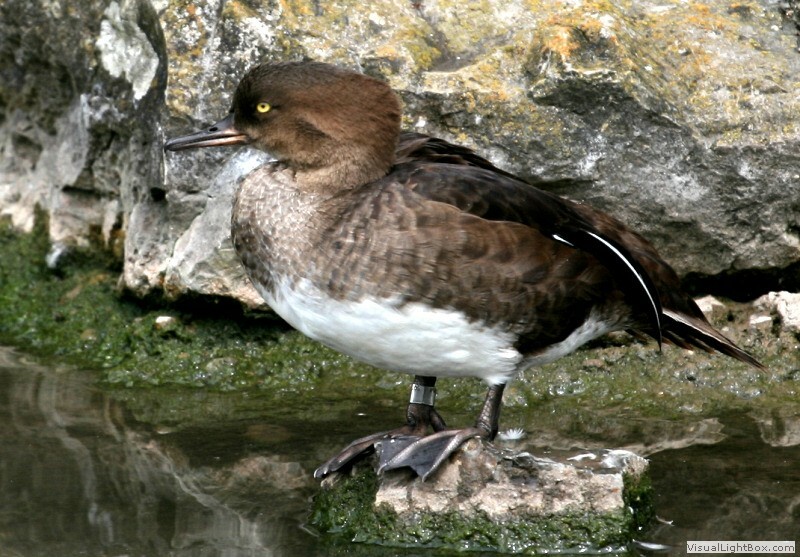 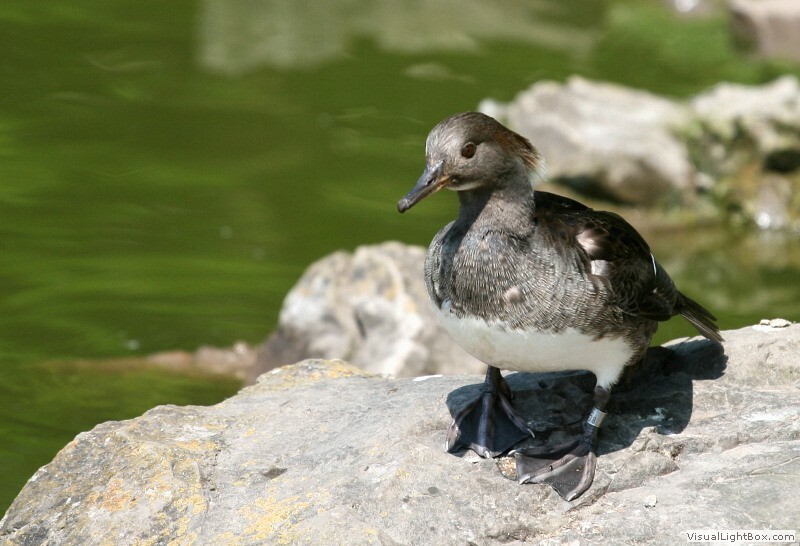 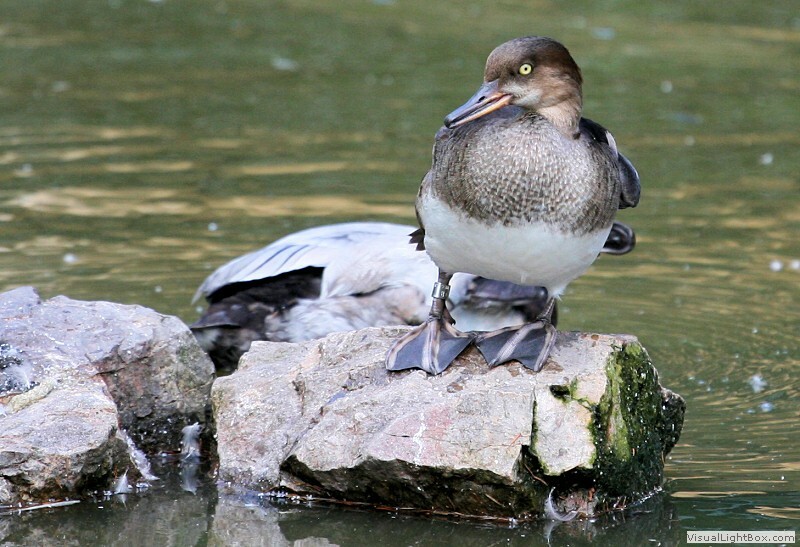 The neck and back are black with a black band across a white breast, reddish-brown flanks, and a thin black beak. 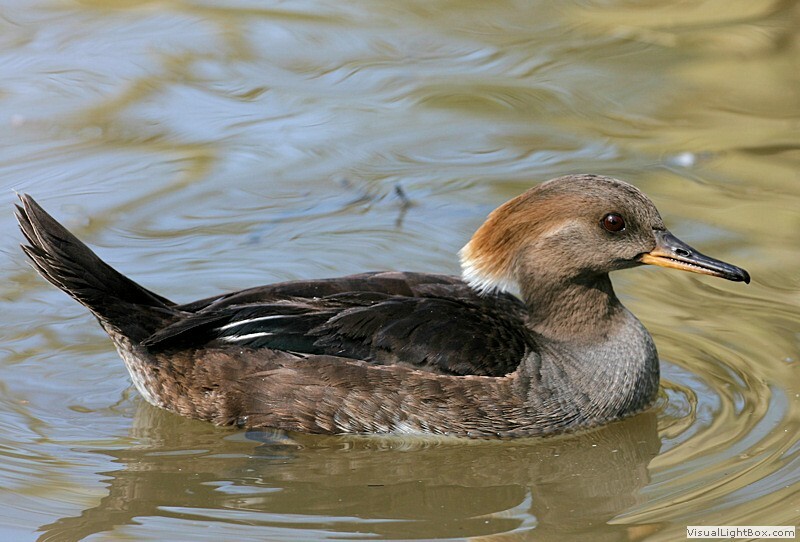 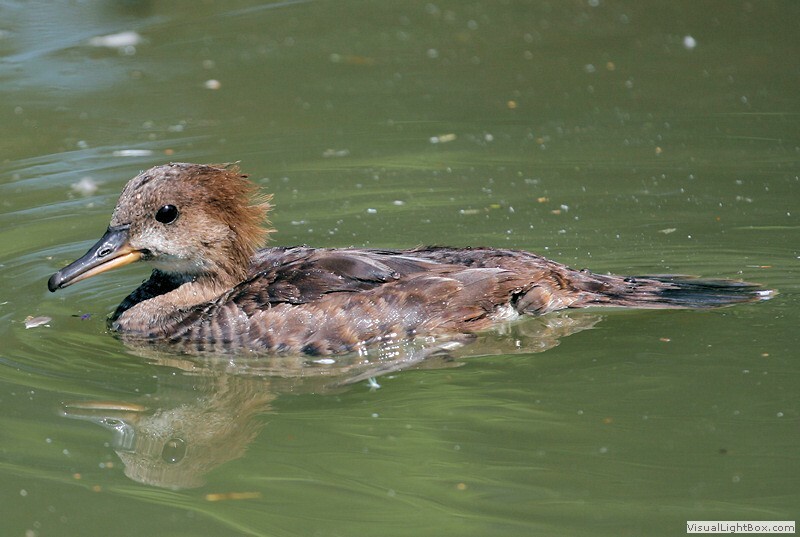 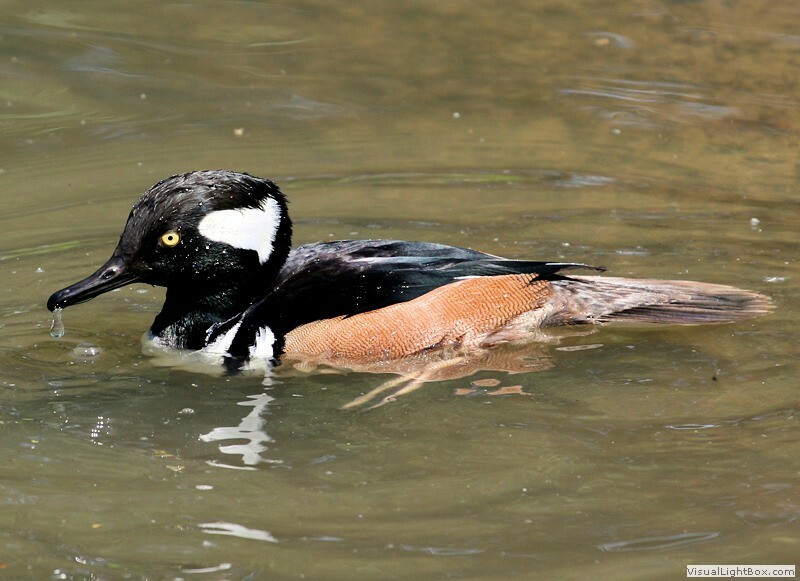 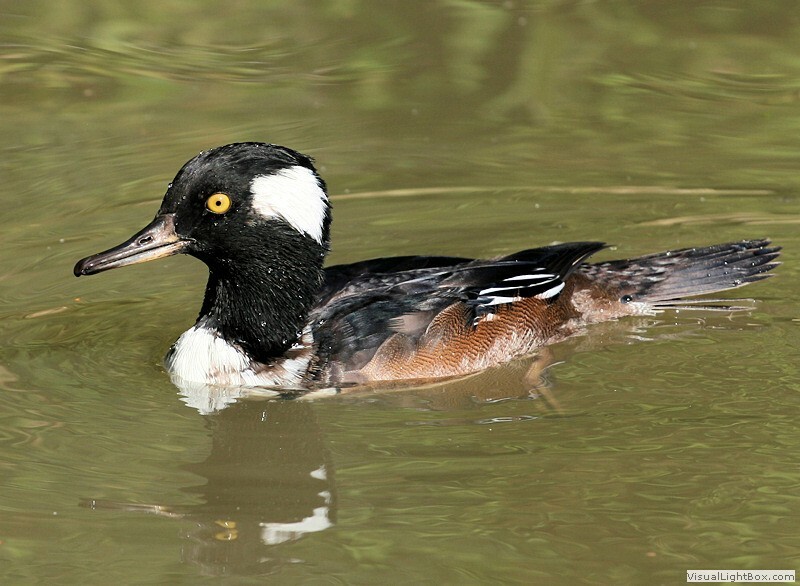 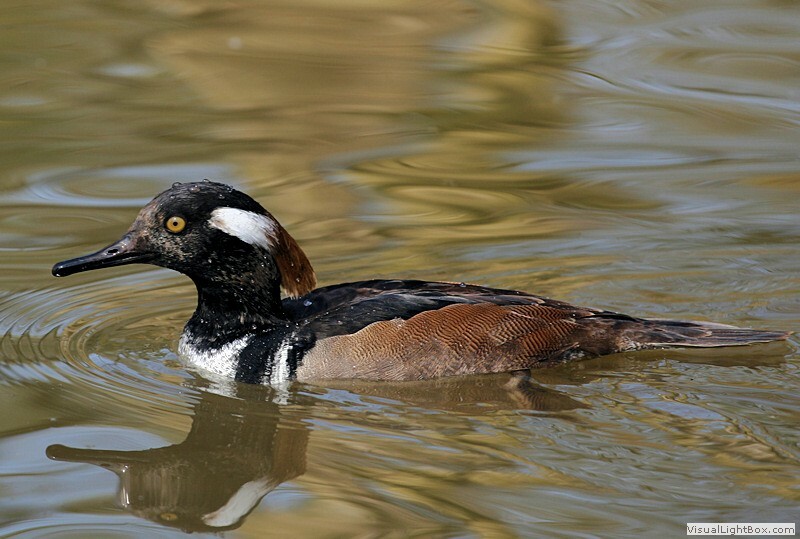 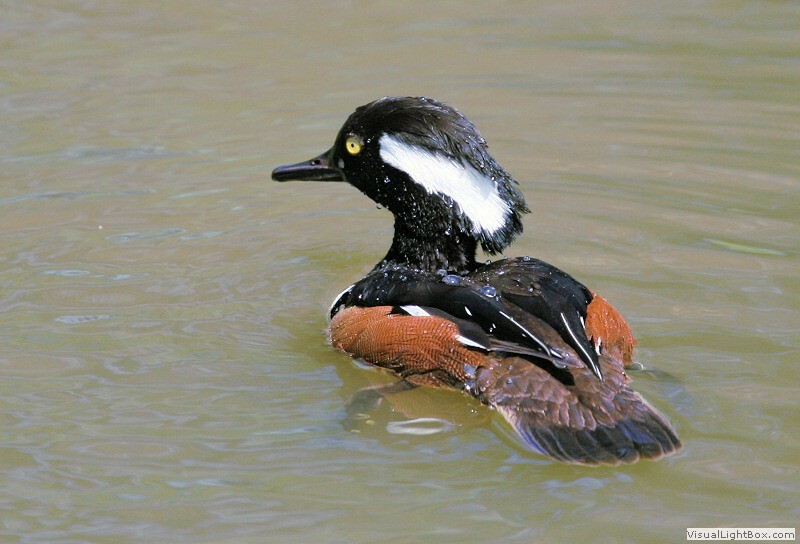 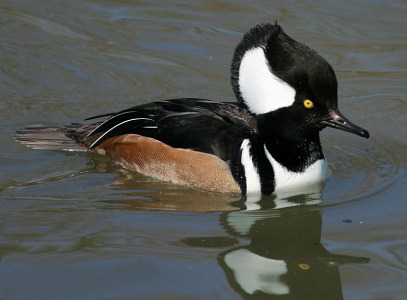 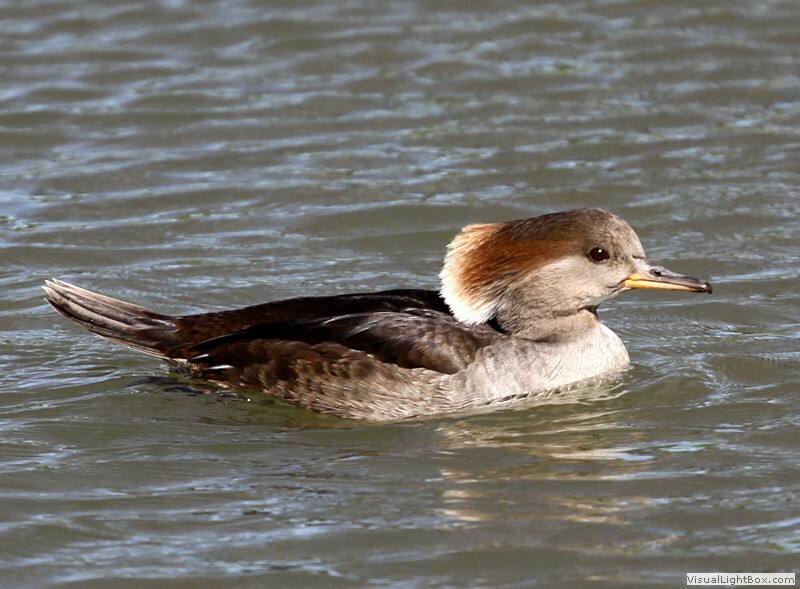 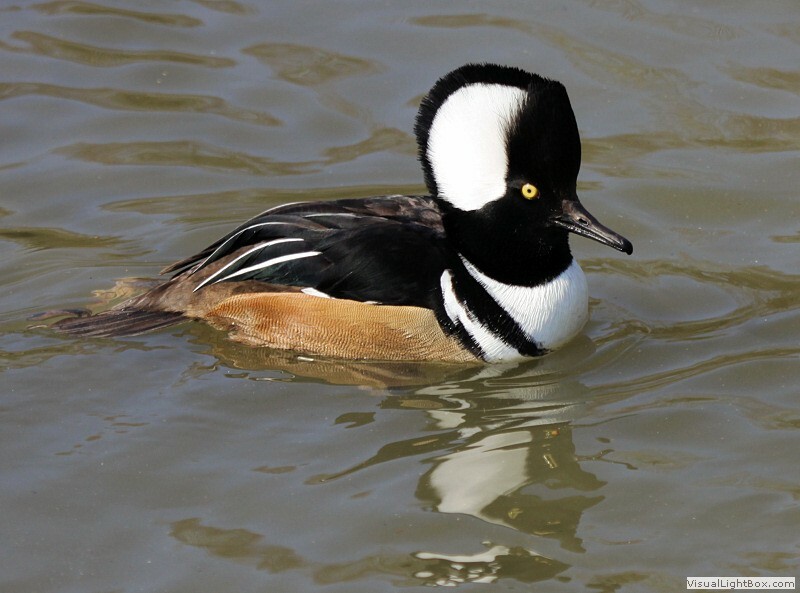 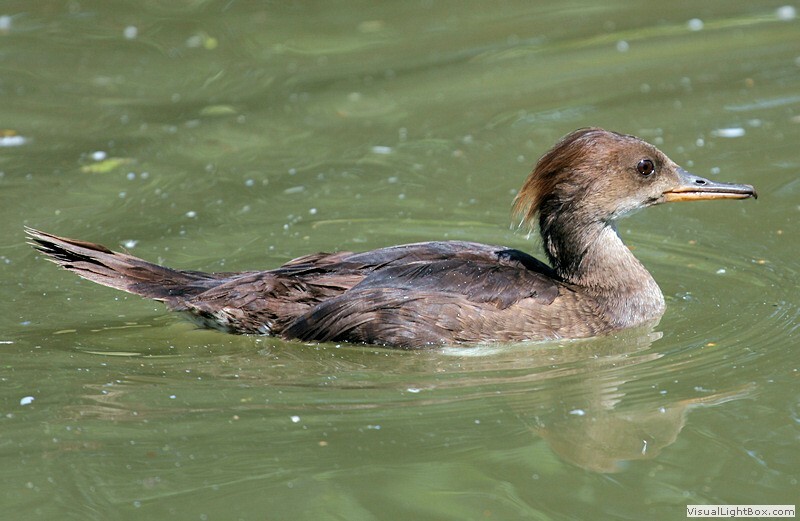 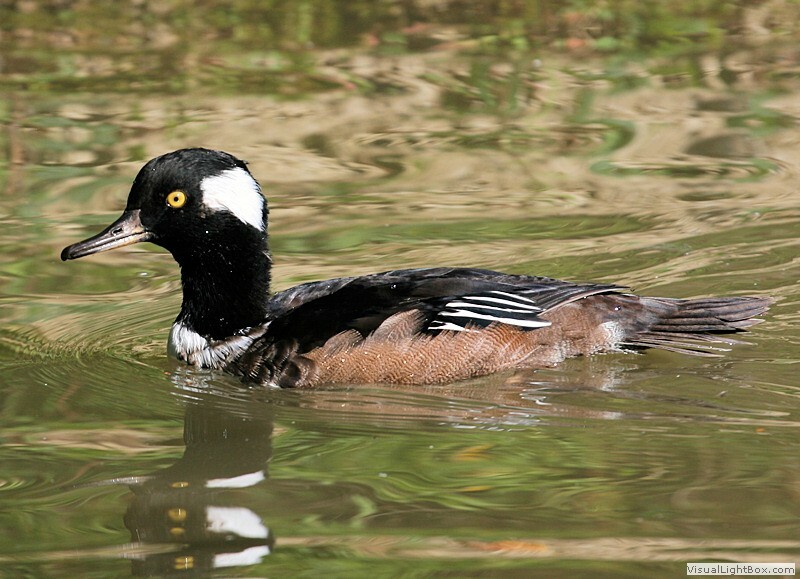 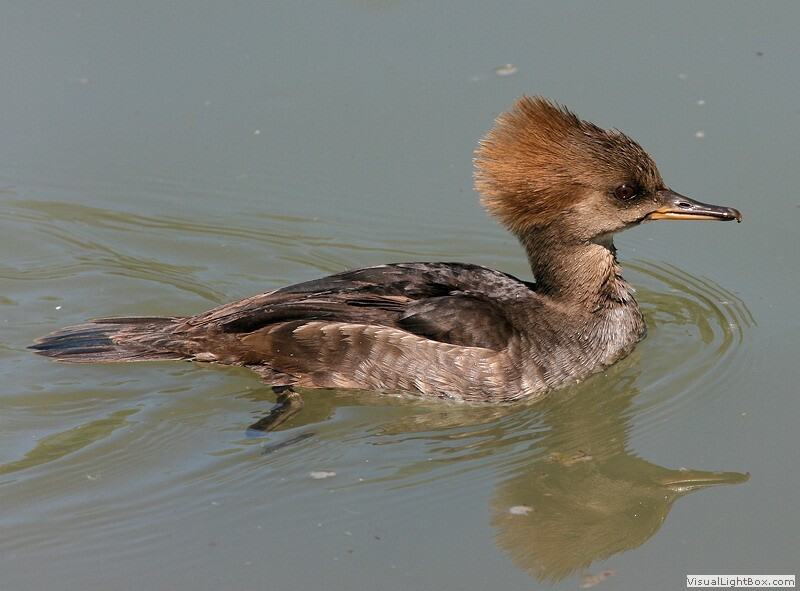 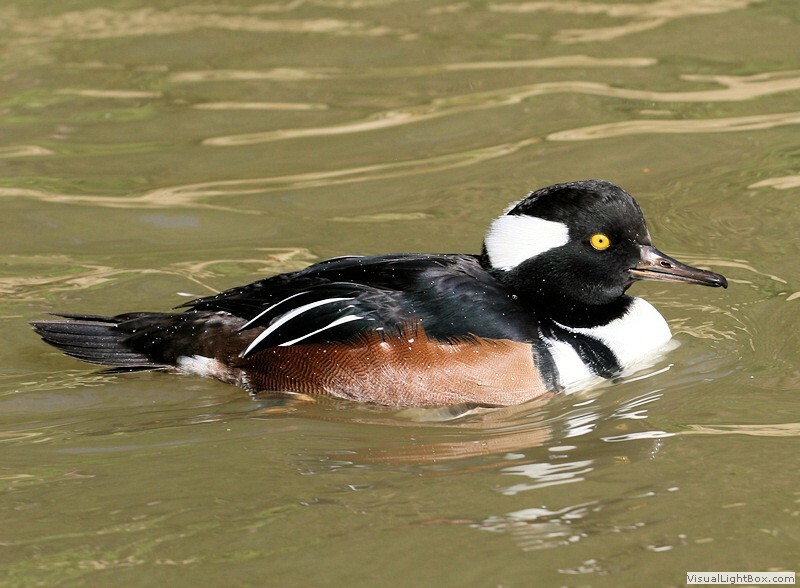 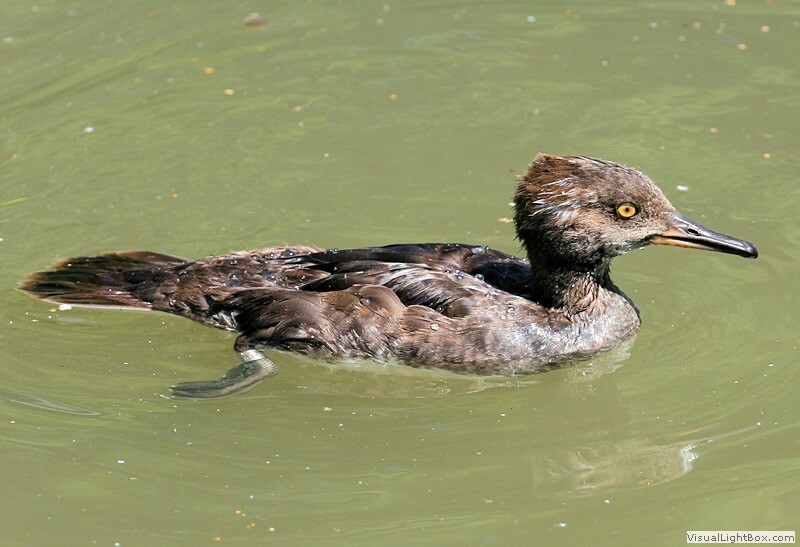 The Hooded Merganser has a sawbill for gripping fish. 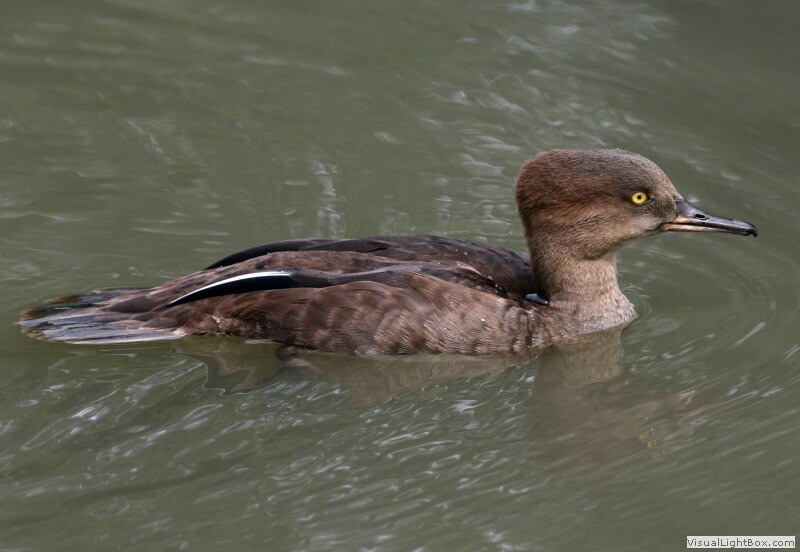 Female - The female has a dull brown head with a smaller red-brown crest, brown eyes, the beak has a yellow lower mandible and darker upper mandible, the upperparts are brownish-grey with greyish upper-breast, flanks, and white lower-breast. 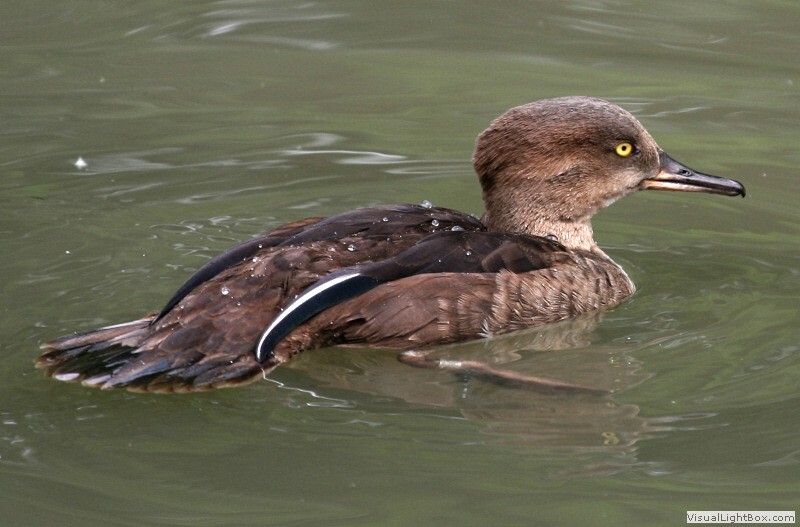 Eclipse - The male in eclipse plumage is very similar to the female but has yellow eyes and a darker beak. 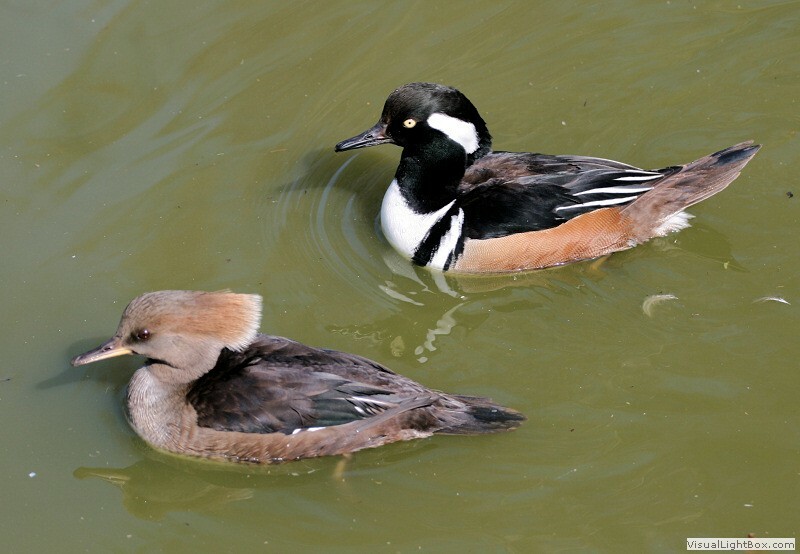 Size: - Typical Adult is about 48cm (19in). 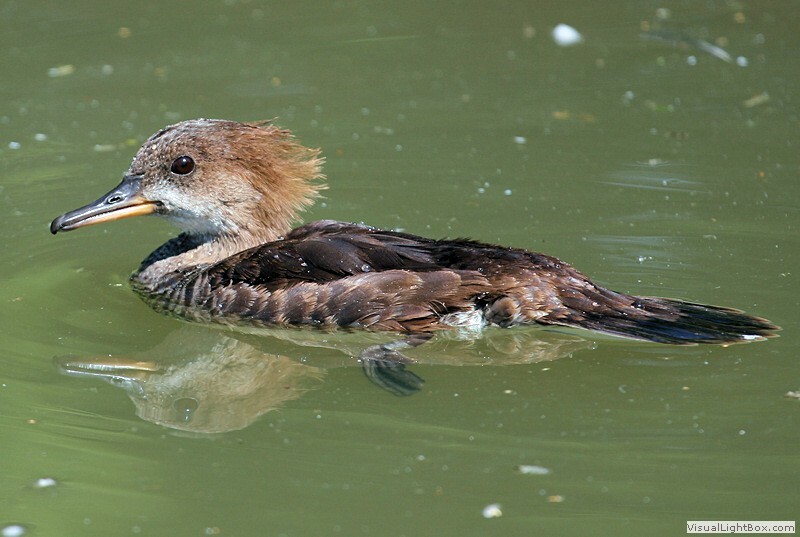 Food: - Small fish, crustaceans, and aquatic insects. 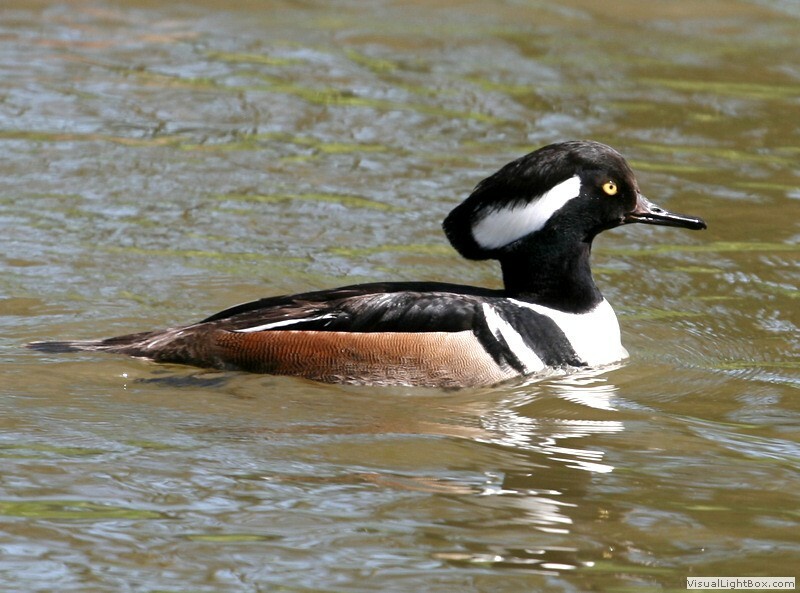 Habitat/Range: - Swamps, wooded ponds, lakes, and rivers in northern USA, and southern Canada. 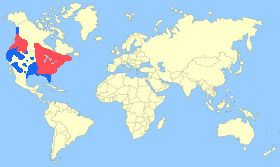 They winter in the USA. 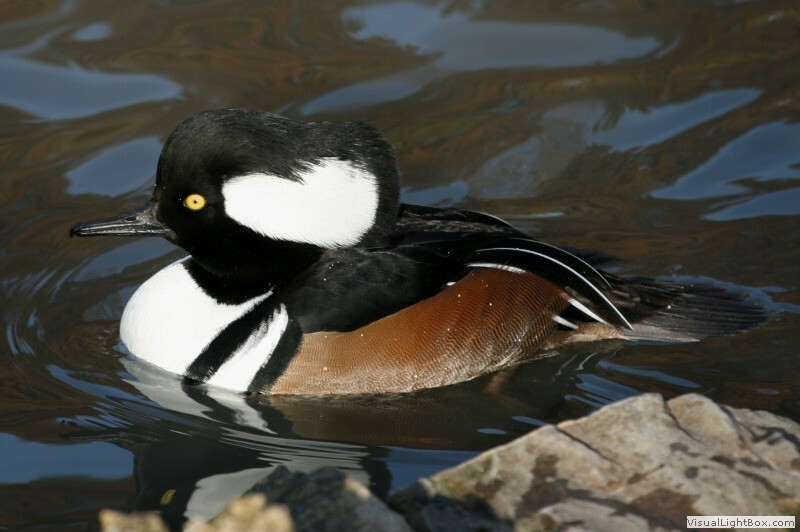 Breeding Season: - March to beginning of May in colder regions. 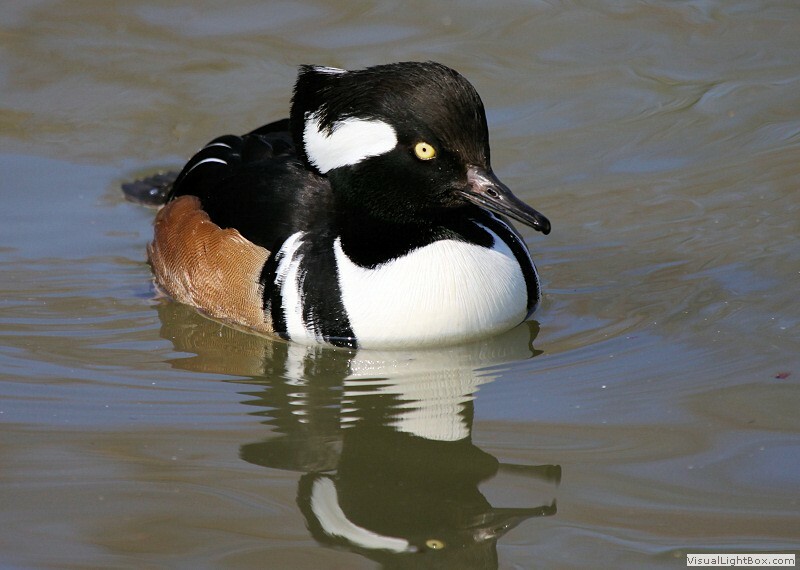 Eggs: - 8 to 12 (glossy white colour). 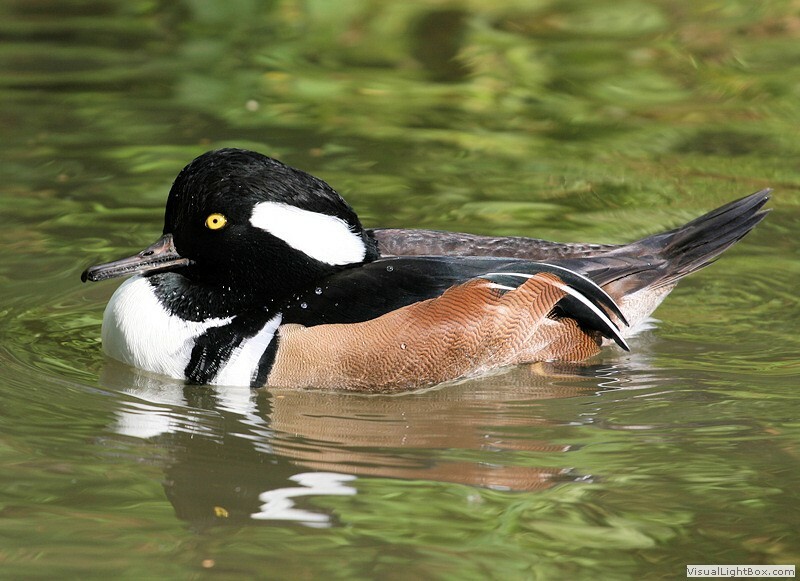 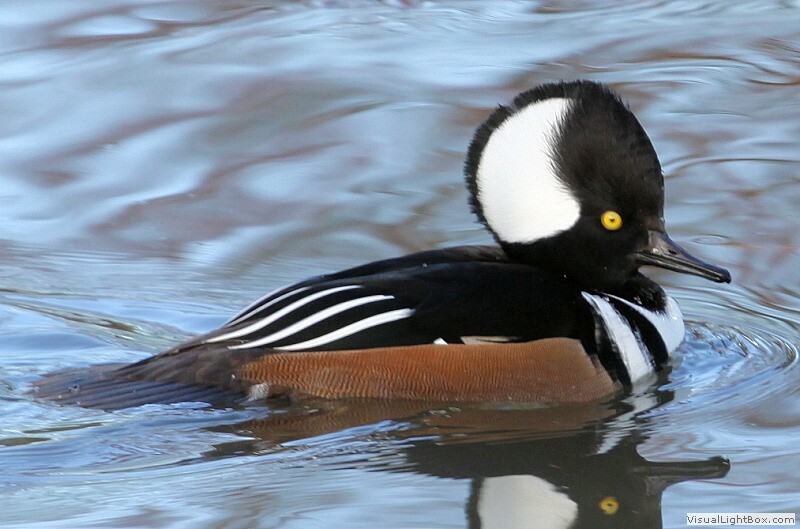 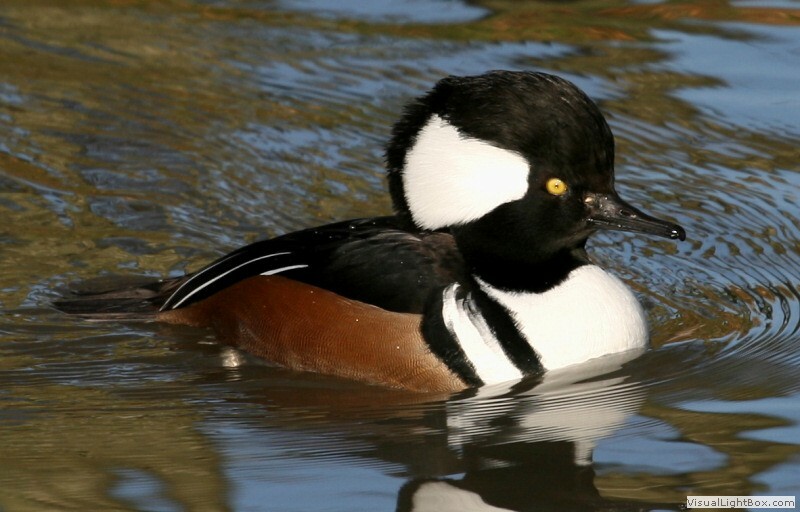 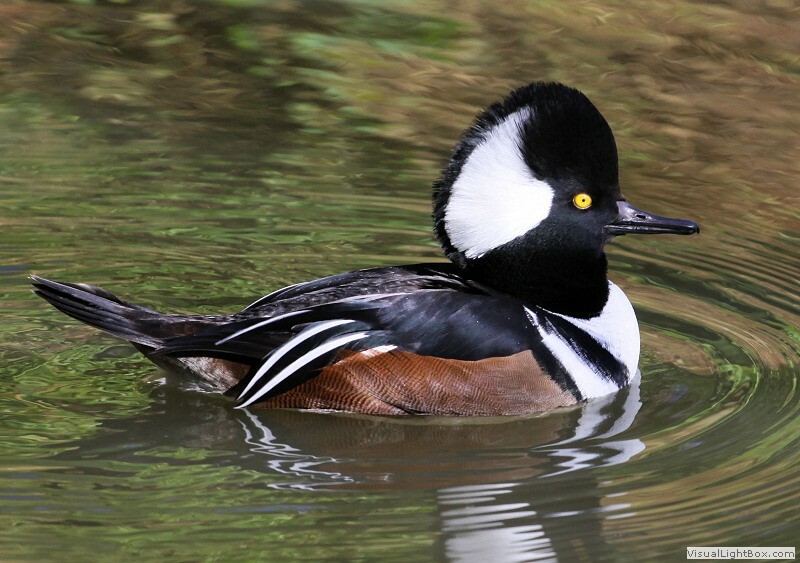 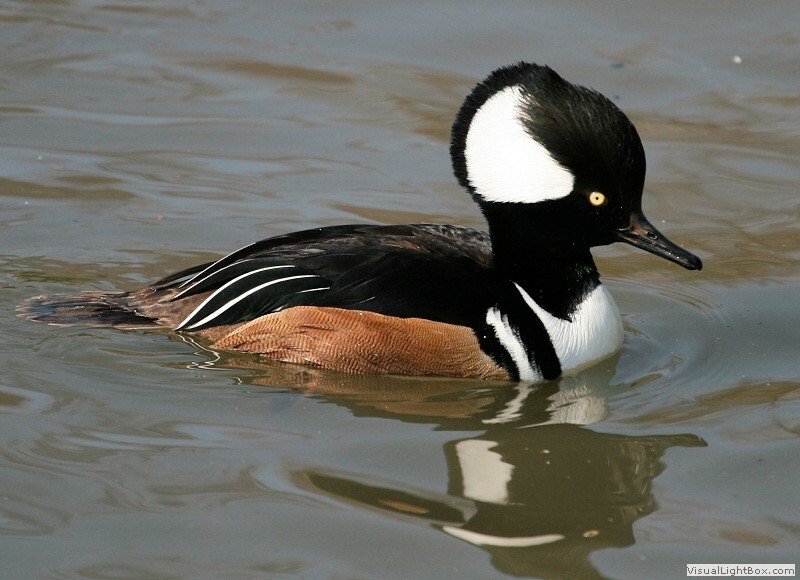 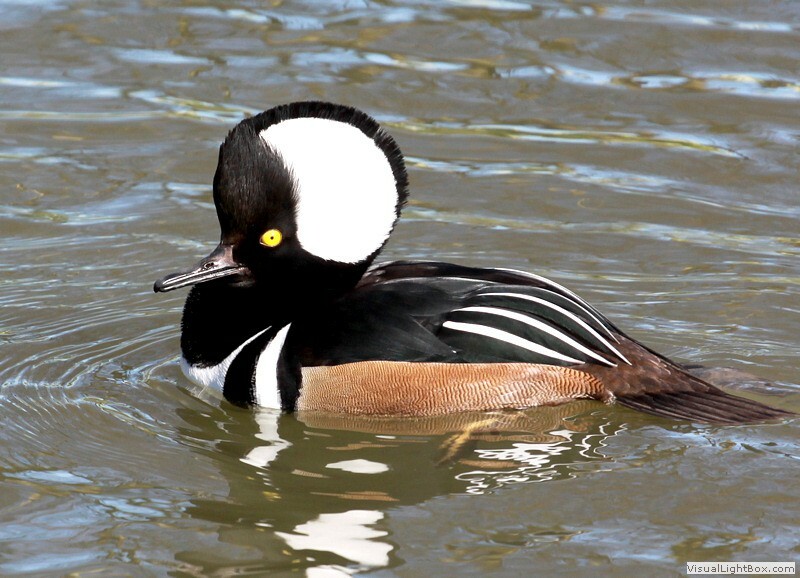 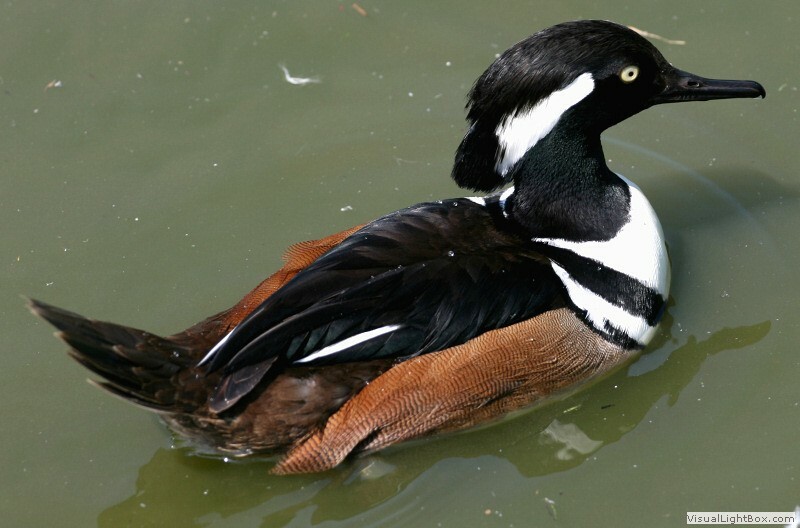 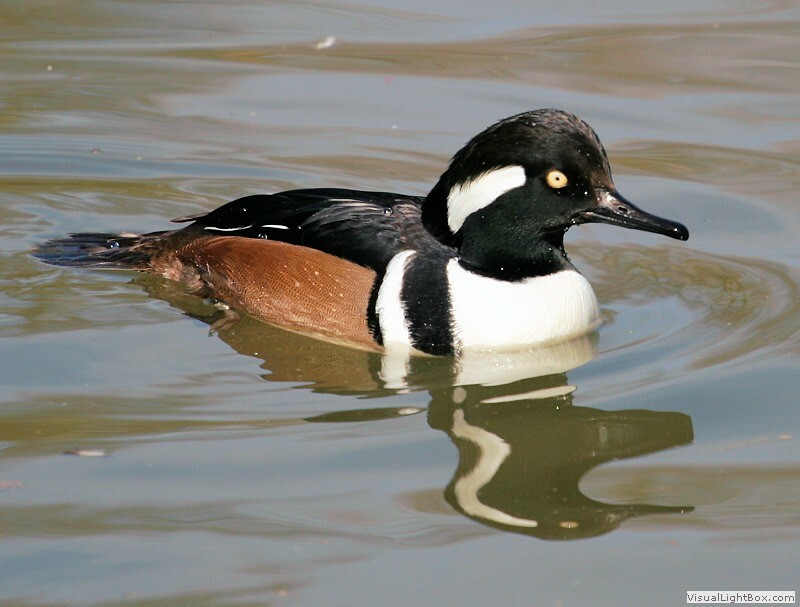 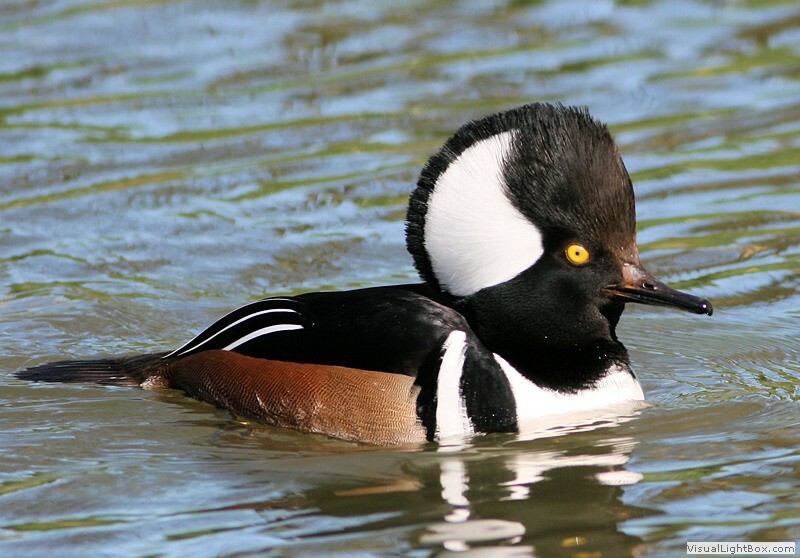 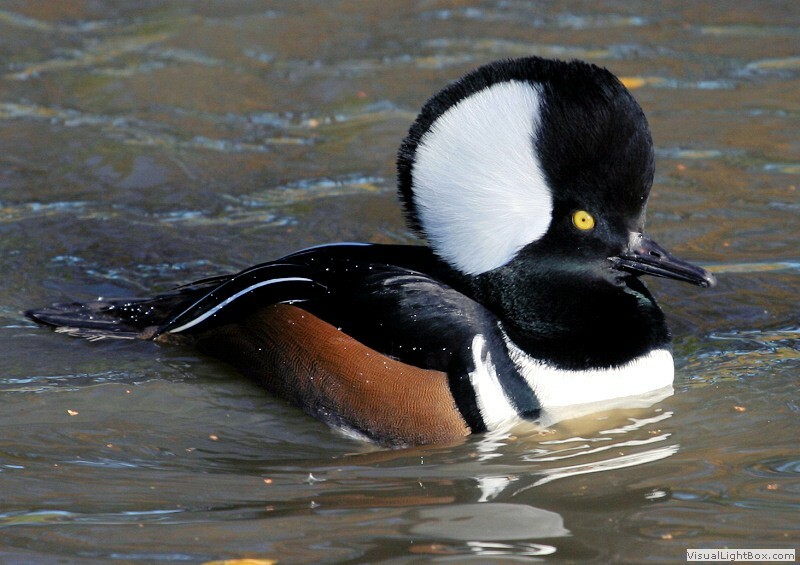 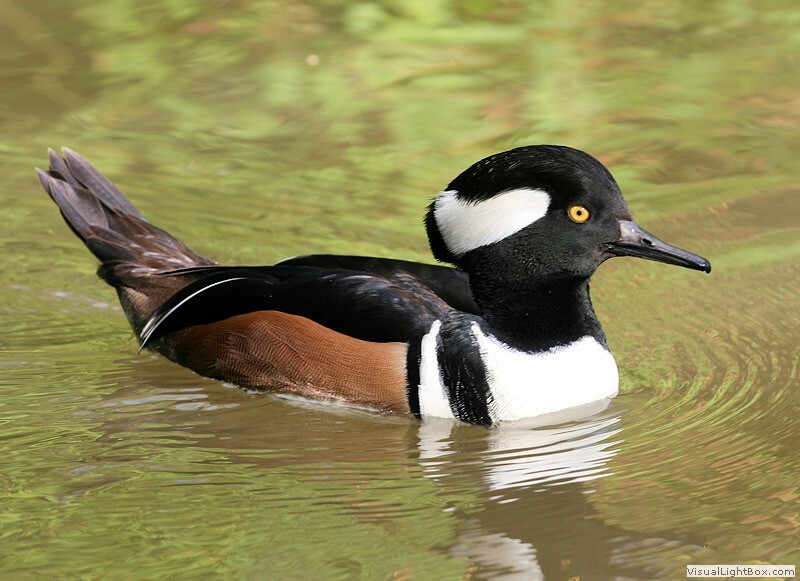 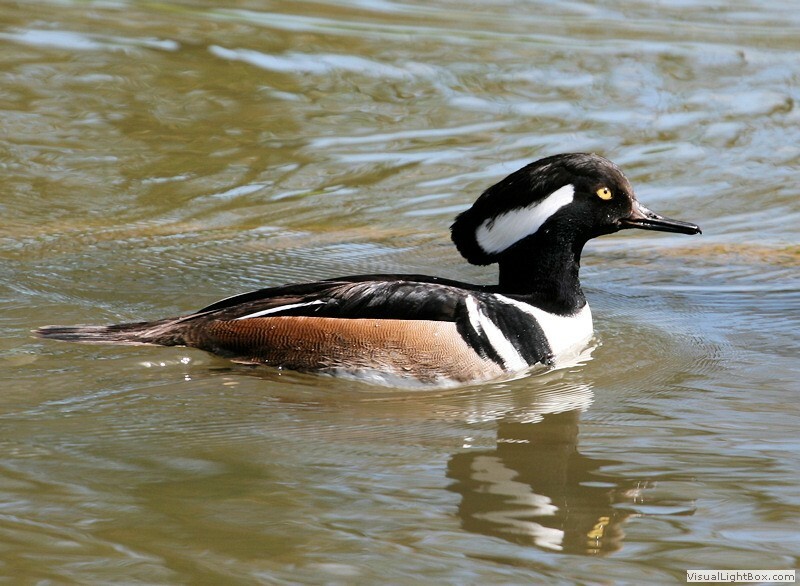 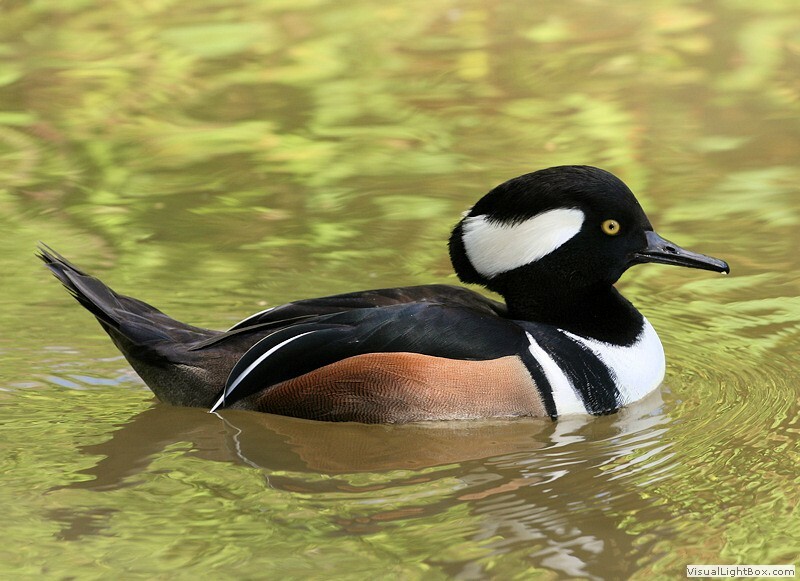 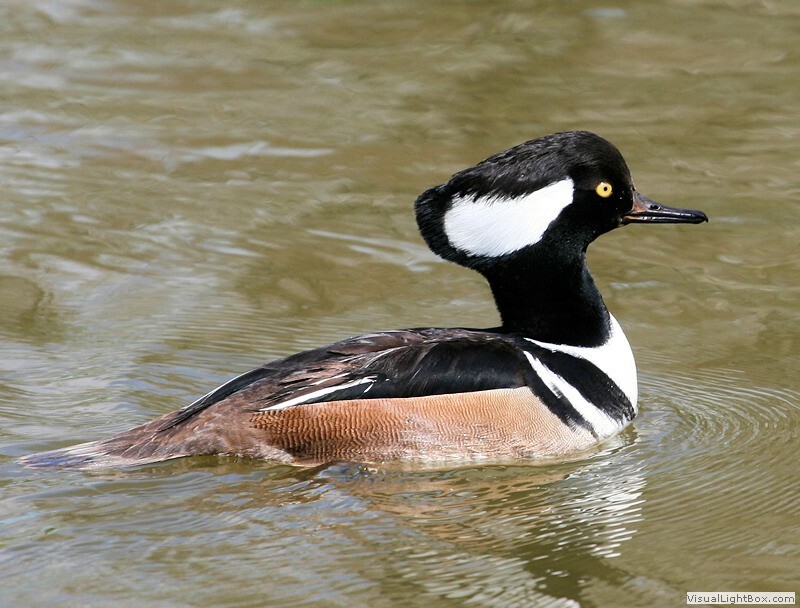 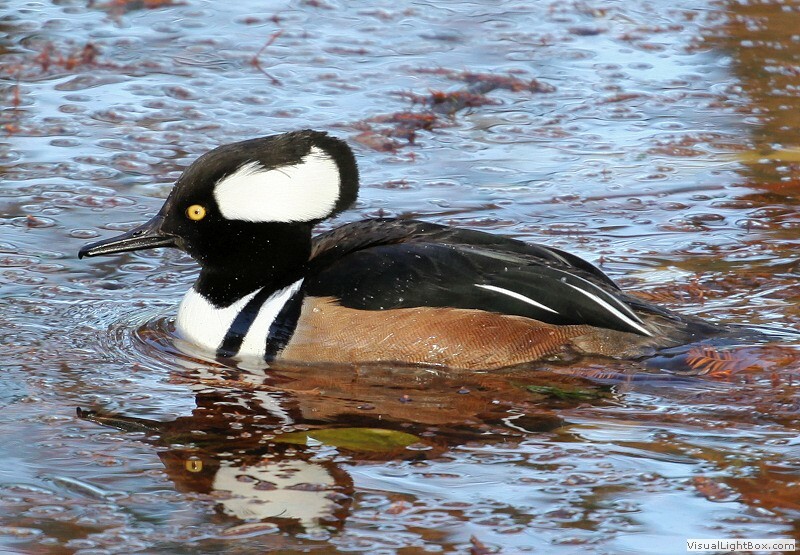 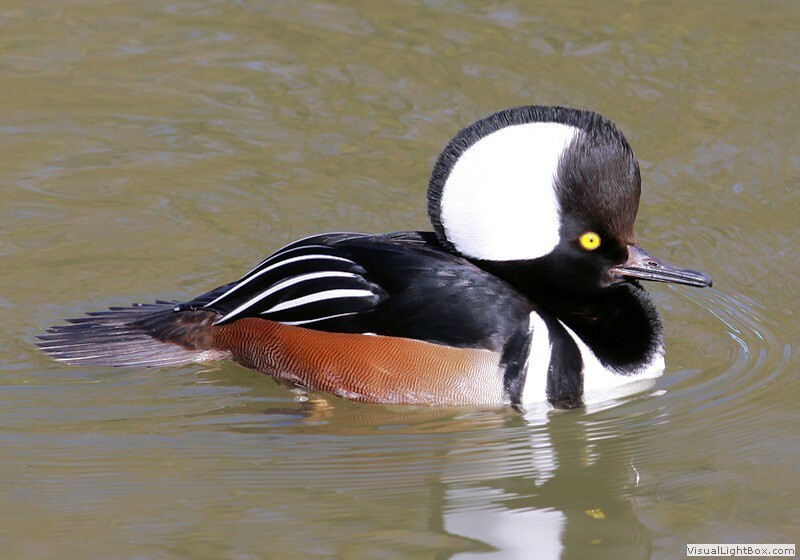 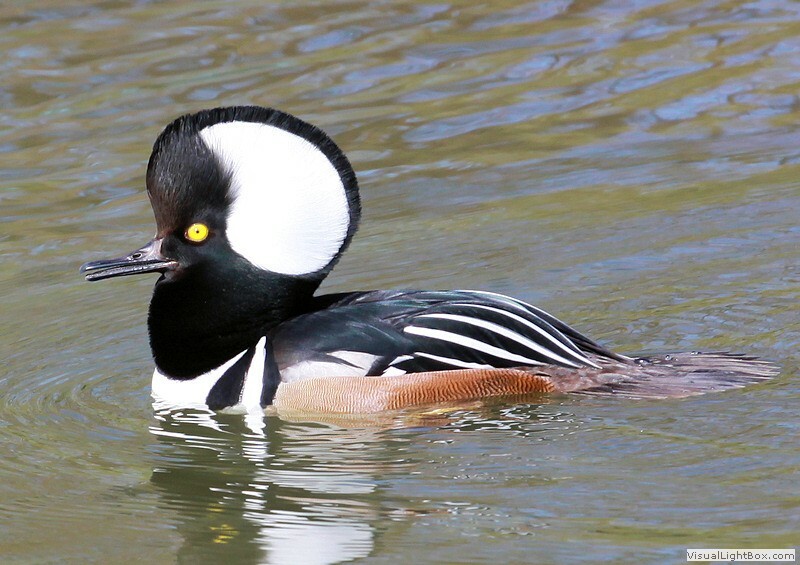 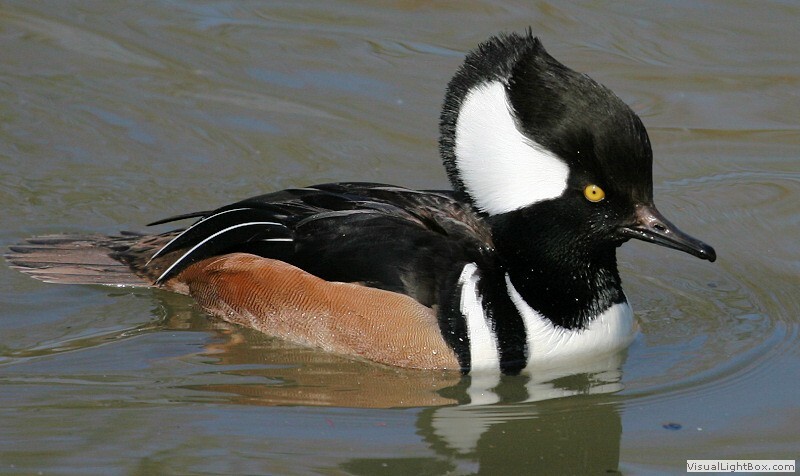 Notes: - The Hooded Merganser is a sea duck. 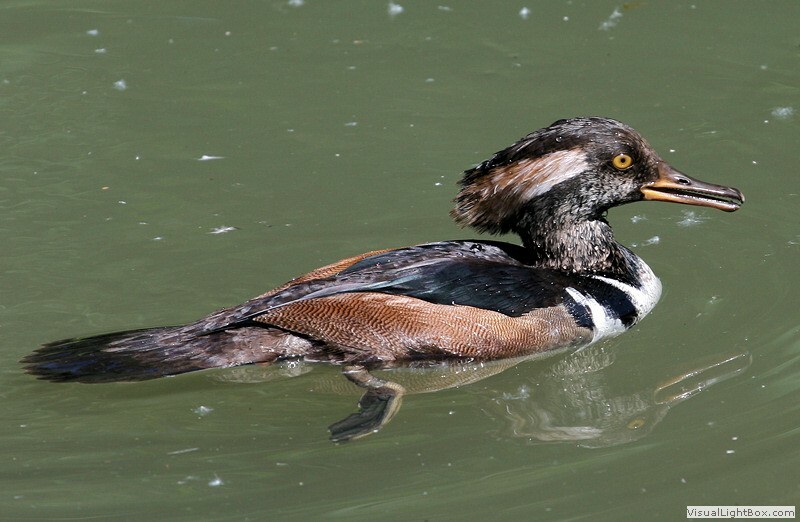 It is able to dive for fish and stay underwater for some time and uses its sawbill to grip the fish.